Chloe sure is enjoying the summer! We have had many dogs over the years, but none of them have enjoyed summer as much as Chloe...it seems. Chloe enjoys running around in her yard...smelling all of the flowers...and she notices each and every new bloom. She LOVES to chase chippies and occasionally, actually catching one! You can tell by the smile on her face that she is in her glory...running around outside exploring! 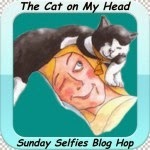 We are joining Sugar and Nola for the Black and White Sunday Blog Hop! Chloe looks as if she is having a great time. Chloe is adorable and sure knows how to do a good selfie! Phod loves the summer because he can swim. Chloe looks soooo happy. I had a dog who used to enjoy summer so he could play in the sprinkler. I could set the sprinkler up in the back yard and he would entertain himself forever playing in it. She sure does look very happy!!! Happy Summer Sunday. Ya shure does look happy Chloe! Go Chloe!! We love summer too!! Thank you so much Janet! I enjoy participating in your hop and hope to continue doing so! Thanks!! We wish we had the weather you all have in California!! Indeed Kim! I love being out with the girls watching then enjoy the sun! Thanks Molly and Mackie! We sure do appreciate the better weather...wintertime can get pretty boring! Thanks so much Ciara and Lightning!! We can tell you are enjoying summer too...that picture of you with your mom's beautiful flowers was awesome! Oh! That's not good...having allergies...we sure do understand! We did too Ann! Zippo used to REALLY enjoy the water...he was part Newf after all! Oh, how he loved playing in the sprinkiler...I still miss him so much! Thanks Sugar...we do love being out and about during the nice weather and cannot wait to get back to the cottage! Thank you so much! We love participating in your hop!! Happy Tuesday to you guys! Thanks! Chloe just loves to be out there exploring whatever she can find!